There were many rifts between the Roman Catholic Church and Protestant reformers in the mid-1500's. Most of these centered around the Catholic Church's belief that the only valid Bible was the Latin Vulgate, produced more than 1,000 years earlier. Many local priests could barely read Latin, even though they were responsible for understanding and enforcing the Bible among their parishioners. Most common people couldn't even read English — much less Latin, so they believed whatever they were told by the Church. Thus the Bible could be made to say anything, and no one was the wiser. Within this environment, the Catholic Church and its clergy soon became corrupt. This gave the Protestants additional ammunition to use against Catholics. By the late 1500's, English Protestants had produced a half dozen different English versions of the Bible, and each of them had become extremely popular. Even some English-speaking Catholics owned copies of an English Bible, risking excommunication to read and understand the Bible for themselves. However things didn't stop there. Protestants produced commentaries, paraphrases, and multi-version Bibles which gave rise to some serious Bible studies by scholars. It was during these times that the Bible displayed here was produced. This page is from "Biblia Hebraica" (The Bible in Hebrew), printed in Antwerp, Belgium in 1584 by Christopher Plantin. Plantin was a good choice for publisher; he was an important pioneer in the development of printable Hebrew and Greek alphabets. Click to the right for a better look at this Bible. Today, we would call this kind of Bible an "interlinear", because it contains two different languages, printed on alternating lines. 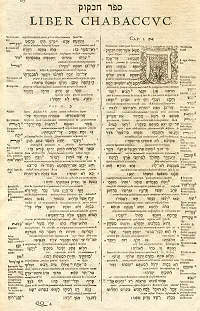 The Hebrew text was the work of Arias Mantanus; at the time he was a leading authority on ancient languages. Interspersed between the lines of Hebrew text, is the Latin Vulgate. Be sure to check out the detailed view; this is a very interesting Bible. Of course the only people back then who would use such a Bible were scholars. Nonetheless the Catholic Church felt threatened, even by works such this. Regardless of the feelings of the Pope, many universities put this and similar books on their shelves; they were considered textbooks for studies in language, rather than studies in religion. It was access to books like these that gave Protestant reformers additional resources for creating new English translations of the Bible.